The District Administration Capital Complex has intensified checking of Bars/ Restaurants and Wine shops. 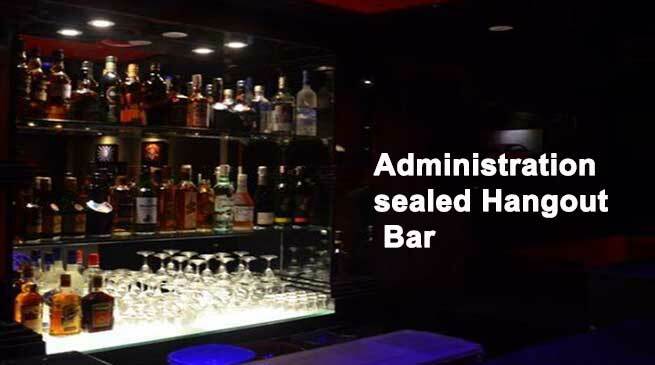 A team led by EAC Naharlagun Hento Karga along with the officials from the Tax and Excise Department and the Police on Tuesday sealed Hangout Bar as it was found to be running without license. The team also sealed Cocktail bar which was found to be selling IMFL beyond the permitted time. The Deputy Commissioner Capital Complex Prince Dhawan, IAS has time and again stressed that the District Administration has zero tolerance against such illegal bars/ restaurants. He informed that the DA has been carrying out such drives for the last few months and hoped that the message is already conveyed to the public. He has therefore sought the cooperation of the public and appealed them to abide by the rules so that such exercises could be successfully implemented. He has also stressed that such regulation if followed by every individual would contribute a lot in maintaining law and order in the Capital Complex.